Summer time is here – the perfect chance to update your diet and enjoy seasonal fruit vegetables and fruits. So while you’re working in your tan, why not get a makeover, a refrigerator makeover that is! We’ve all heard “you are what you eat”, but eating right at home starts before you even open your mouth. 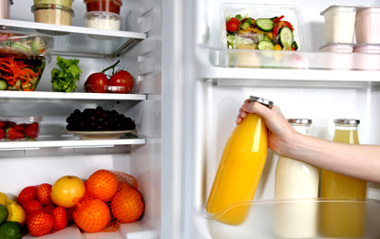 Get off to the right start by shopping and stocking the fridge the skinny way. Listen as I break it down in four steps for radio hosts and their nationwide listeners – making healthy shopping choices is easier than you think! Simple changes, such as choosing to eat more fruit in place of sugary processed sweets (the average bowl of berries contain 5 g sugar with loads of antioxdiants and fiber while a a cupcake contains 17 g and no nutrition). Changing what’s in your fridge really can help change you. Kiwis, mangoes, papaya, think of these summer fruits as candy! These are just a few choice fruits you can use to make a super salsa. Summer is the perfect time to mix and match different flavors since the options are plentiful. And salsas aren’t just made from tomatoes, you can use other vegetables, fruit, chilies, beans, and lots of fresh herbs to make your own unique combination. If you have a chance to browse a local farmer’s market, you’ll find plenty of supplies that you can mix and match. Give the ketchup a rest and use salsa to top sandwiches, burgers, fish dishes, scrambled eggs, and stir into homemade iced teas. Salsa adds flavor without fat, high fructose corn syrup, plus you can score a half serving of fruit or veg! 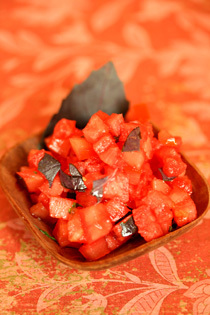 If you love to entertain in the summer you can leave the oven off and host a salsa party. The Fourth of July is the quintessential American holiday, filled with food, friends, drinks and parties. But how do you navigate the barbecues without spoiling your summer figure? Don’t panic – burgers, side salads, drinks and desserts don’t have to be deal breakers! Who says you can’t have your cake and eat it too … we beg to differ! Try my turkey burgers, spinach strawberry salad, zucchini salad, papaya-lime cooler and Devil’s food cake. Trust me – no one will want the mayonnaise-laden store-bought potato salad that Aunt Jan brought! If you want to be sure that your grilling really is healthy, check out my blog on skinny marinades. I recently visited the beautiful new Ishta Yoga studio where you can learn the basics of yoga or experience a challenge as an advanced practioner, have spa treatments and teach courses in meditation. Are you interested in deepening your yoga practice? Visit the Ishta Yoga Center on 56 E. 11th St. (Bet. Broadway and University) to expand your knowledge in the sciences of Hatha, Tantra, and Ayurveda. They also offer teaching certification if you ready to pursue a spiritually fulfilling career!